Latest update: 2017-05-08 on Wallis blog – added Wallis pictures from Henk. 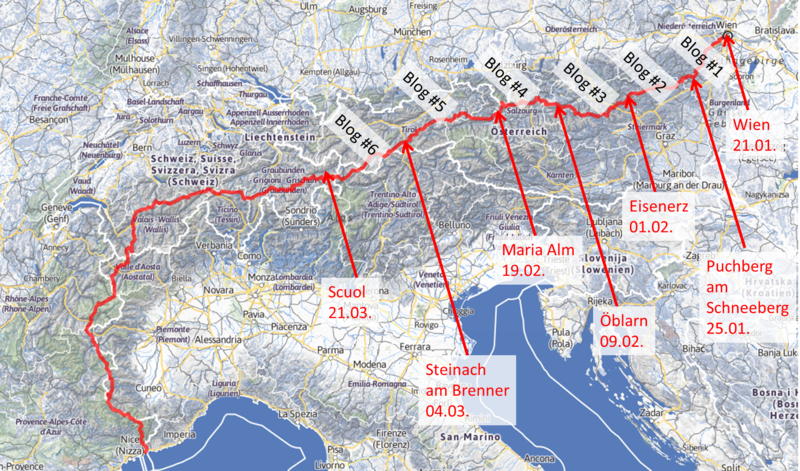 Merged transalp blogs into one blog. I spend some time in wallis with henk. Find pictures on the Wallis blog. I spend some time in valle d’Aosta and in Finale ligure with Alex. Find pictures on the Valle d’Aosta blog. I spend some time in Ortler group with mike. Find pictures on the Ortler blog. I stopped the project transalp after half of the distance. I had very good conditions, besides sleeping arms no physically problems but I lost fun to go on through Swizzerland which I know very well already and which would be so expensive. I will spend the complete april again in the alps but with normal ski tours and no traverse any more. So stay tuned … updates will follow. Thanks so far for all support: accompanying me, maintaining basecamp, repairing things, mentally support and comments from all of you! In total I went 1050 km distance and about 60500 m up and down. [2017-01-21 … 2017-01-25] From Vienna to Puchberg am Schneeberg. On the way to the real alps. [2017-01-26 … 2017-02-01] From Puchberg am Schneeberg to Eisenerz. Traversing the first mountains: Schneeberg, Rax, Veitsch, Hochschwab. [2017-02-12 … 2017-02-19] From Öblarn to Maria Alm. Northern Kalkalps: Dachstein, Tennengebirge, Steinernes Meer. [2017-02-23 … 2017-03-04] From Maria Alm to Steinach am Brenner. The typical winter tour area: Kitzbühler and Tuxer alps. [2017-03-05 … 2017-03-21] From Steinach am Brenner to Scuol in Swizzerland, passing Stubaier, Ötztaler and Sesvenna group. Dieser Eintrag wurde veröffentlicht in Allgemein am 6. November 2016 von thomaspablitschko.